I love my herb garden! It's so handy to have! When my herbs needed cutting, I decided to make some herbed goat cheese. I just used what I had to make it work! The herbs in my goat cheese were: chives, dill, and parsley. I kept adding them until it tasted good to me. Remember, stuff like this doesn't require exact measuring! You're not baking! To store the goat cheese, I wrapped it in plastic wrap. I used the wrap to shape it into a log. My plan is to pull it out when I company for a pretty presentation with crackers. That night for dinner, I made us something light and delicious! 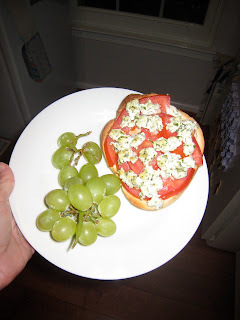 A toasted Challah bun with a farmer's market tomato and the herbed goat cheese! I broiled it in my toaster oven until everything was golden brown! Hmmmm...tasty!